Walk into Msgr. King Hall at St. Thomas Aquinas parish, Flatlands, and you will immediately see that the parish’s sports association has done a fine job in keeping alive the many basketball memories of the past. And from Dec. 26 to 30, a new chapter of that storied history was written in the form of this year’s Msgr. King Basketball Tournament. 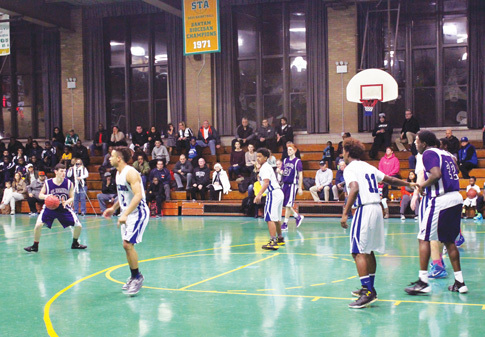 The Christmas break marked the 47th time the parish has hosted the tournament, which combines top high school boys’ varsity hoops teams from both the CHSAA and Public Schools Athletic League (PSAL). This year’s field included local CHSAA teams St. Edmund Prep H.S., Sheepshead Bay; Nazareth H.S., East Flatbush; and St. Mary’s H.S., Manhasset, L.I., as well as public school teams from North Babylon H.S., L.I. ; Midwood H.S. ; Transit Tech H.S., East New York; Bedford Academy H.S. ; and Susan E. Wagner H.S., Staten Island, which defeated Transit Tech in this year’s championship game. The tournament is named after former St. Thomas Aquinas pastor Msgr. Jeremiah King. In 1954, he instituted a fundraising campaign to help underwrite the cost of three new parish buildings, one of which was the gymnasium. The first tournament, sanctioned by the CHSAA and PSAL, was held in 1962 and honored Msgr. King, who was dedicated to the spiritual and physical well-being of the parish’s children. When it was founded, it was the first high school basketball tournament to be played at a grammar school gymnasium in this country. After a 10-year hiatus, the Msgr. King Tournament resumed last year. The parish’s athletic representative, Guy DeFonzo, originally had a five-year plan for bringing the tournament back to the parish, but with the help of pastor Msgr. John Brown, the tournament made its return a year early. The historic feel of the tournament easily makes it the premier holiday hoops competition in the area. Though many high schoolers enjoy time on vacation during their holiday break, these cagers took pride in representing their school in front of the local Brooklyn community. Not only did Mullin, a 16-year NBA veteran and current head men’s basketball coach at St. John’s University, Jamaica, take to the iconic green floor at St. Thomas Aquinas, but Los Angeles Lakers forward Metta World Peace, formerly Ron Artest, was a two-time Msgr. King Tournament MVP for LaSalle Academy, Manhattan, in 1995 and 1996. Adding to the history, four of the eight coaches in this year’s field actually played in the tournament when they were in high school. Another aspect that makes the tournament unique is the combination of CHSAA and PSAL teams. These teams typically do not play each other during the regular season, so it gives the players a chance to learn from top-notch opponents. The motto of this year’s tournament was “Keeping the Tradition Alive,” and a competitive slate of games coupled with a historic feel in the gymnasium did just that.